Nowata Printing offers coldset web offset printing in our pressroom. It is a process in which ink is allowed to dry naturally through evaporation and absorption. Coldset printing is used on uncoated paper stocks such as newsprints. With coldset presses in each of our locations we are able to serve a wide range of customers. 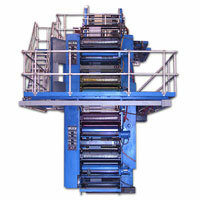 Our cold presses are state of the art, providing a very clean, well-registered product. The ink does not set immediately, therefore, a bit of residue remains on the paper. It is an economical form of printing that allows several webs to run at the same time, using less expensive paper and energy to print the final product. Coldset printing is used for many of the world’s daily newspapers due to the frequency of printing Coldset ink continues to dry over time and the printed product retains the smell of the ink. This type of printing will work well for flyers, coupons, industrial catalogs, order forms, and mailings. In contrast, heatset printing is used more often than coldest printing and dries the ink right away, but both serve a valuable purpose and can meet your printing project specifications. For more information on coldset printing, contact our team.